Bright and early we were awake before the sun arose. The plan was to dismantle tents and pack the van before breakfast. Everyone pitched in with a will but it was soon apparent that fitting all our luggage into the van would take far more time than if we had bought the trailer. Anna Maria walked the younger ones back to the local park, to play on the playground, to run all ‘wiggles’ out before the long trip ahead. They stopped to buy milk at the supermarket for breakfast. Prior to our trip I had planned and shopped for meals on the road. Muesli and tin fruit for breakfast, sandwiches for lunch and BBQs with fried potato chips for tea. When needed we would add small items from local supermarkets, such as milk and fresh sandwich meat, this worked out to be a most economical way to travel. Food certainly was much dearer in Outback Queensland shopping at my own supermarket was a far better option. After we finished packing we all arrived for breakfast, the children decided to clean their bowls by placing them onto of the park’s sprinkler system, an instant dishwasher, producing some laughs. We rolled out of Tambo just before 8am. Carpenter was to drive for a large part of the day, adding hours and experience to his learner’s driving log. Tambo through to Blackall (Pop.1800), the grass was plentiful as we drove through, attractive cattle country dotted with trees. Onto Barcaldine (pop. 1900) where we stopped for morning tea, playing in another park, blade boarding along the footpaths. Huge road trains filled with cattle drove through the town, an intersection of highways. 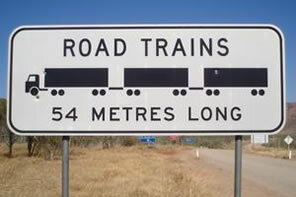 Road trains here were far longer than at home. Whereas we were used to two trailers, sighting three and even four trailer lengths was to become common, by the end of our trip a semi-trailer was to look small. Most impressive was Carpenter’s cool in driving past these huge road trains, I admit I was daunted when I took the wheel. We drove into Longreach(Pop 4700) for lunch. Our intention had been to attend a couple of tourist sights in Longreach; The Stockman’s Hall of Fame and the Qantas Museum. 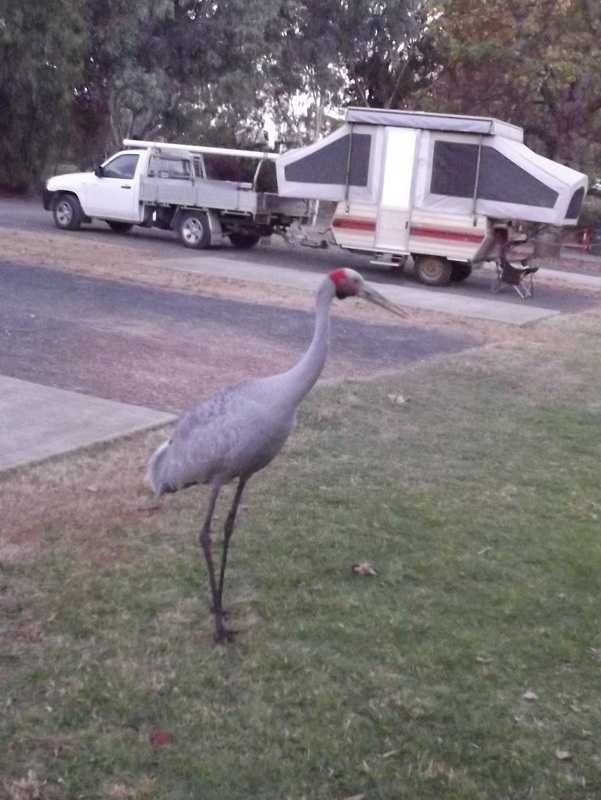 However we were to find Longreach quite touristy and over-priced, certainly not easily affordable for a large family. After a family council in which the children declared they were not interested in tourist sights, the decision was made to push on for Winton for the night. Carpenter now handed over the driving to me and I drove until we took a break at a road side stop for Bass just outside of Winton. As PC drove into Winton (Pop.1000, home of Banjo Patterson) at 4pm we discussed the possibility of continuing on. The children were eager to reach Mt Isa that night, eager to see family and not keen to unpack and re-pack again. As the next town, Cloncurry was 3 hours away we realised tea would be sandwiches by the side of the road. We set out to find a supermarket, but in this small town the best we found was a green grocers with extras. Can you believe a 1kg block of cheese was $16!!!! Back home it was $7, I vowed to never whinge again. Just before dark we stopped outside of Kynuna (pop 20) at a roadside stop for tea. No parks here but the children managed to run up and down, stretching the ‘wiggles’. The grass was not so plentiful here, lots of cattle and plenty of dirt. 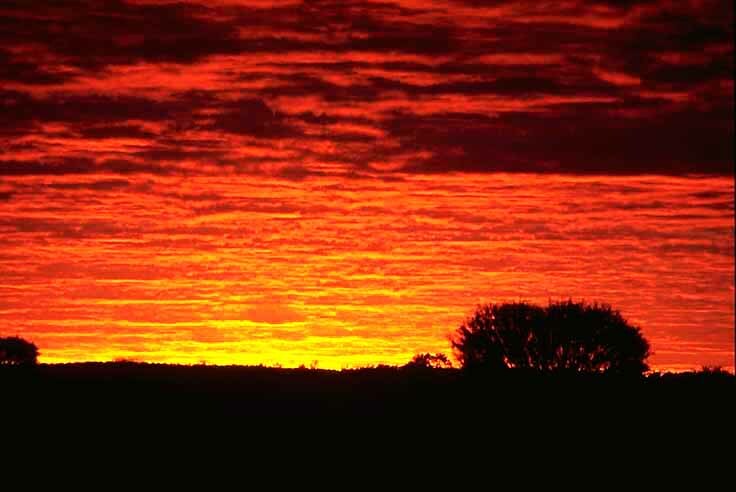 Very peaceful though, the sunsets in the outback are incredible, an orange horizon. PC chatted to some grey nomads who were settling down in their camper on the side of the road for the night. We had passed many grey nomads(retirees) throughout the day who comprised the bulk of the tourist industry in the Outback. Despite the fact that we could drive for hours without passing a car it was surprising just how many tourists there were in the Outback. All day the children had been excellent travellers, we had listened to chapters of an audio book, Deltora Quest, they had read, listened to ipods. For the little ones our Travel Directors; Anna Maria and Michelangelo had invested hours into making up bingo games etc and packing colouring books etc. Anna Maria had written and laminated ‘I spy’ charts of; cattle, kangaroos, caravans etc. (which I promise to share later) We were surprised though in the variety of road kill, the list grew from emus to include; a deer, a pig, birds and many kangaroos. In the distance we also sighted (live) brumbies, camels and a wide variety of birds. Kynuna through McKinlay (pop 30), the topography changed to hills and sweeping curves. It was disappointing it was dark as we couldn’t see the country we were travelling through, however we did see the mice scurrying on the highway and the swooping white owls. We were quite distressed when one flew into us. Onto Cloncury (Pop. 24000), arriving at 9pm, the children were still keen to continue on, PC wasn’t tired as he had only begun driving in the late afternoon. We rang my brother’s family and discussed arriving that night. Chloe graciously welcomed us and warned us to keep an eye out for cattle on the highway. The night was totally pitch black, with the occasional 4 trailer road-train passing, on the winding hills. PC, an incredible driver, got us to Mt Isa safely. 10.45pm I awoke startled as PC slowed down driving into Mt Isa (pop 23000). Wow, by night what an incredible sight. 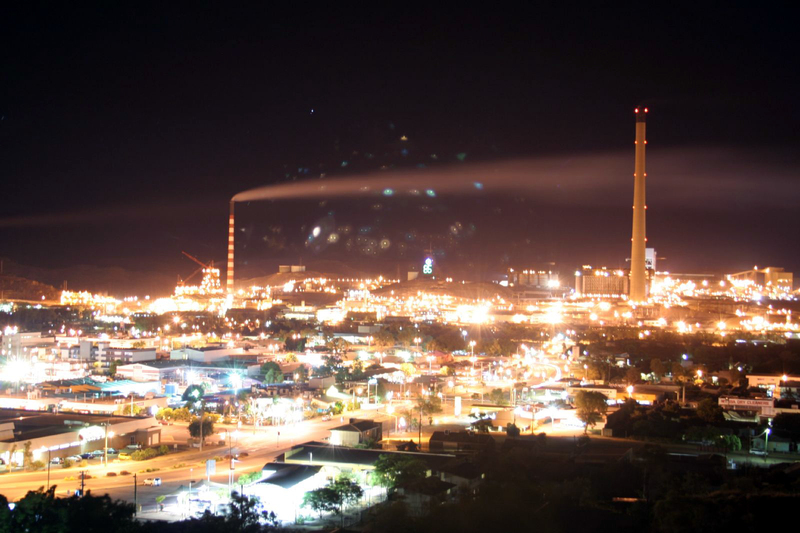 The lights of the mine gives the town an appearance of stretching onwards. Minutes later we arrived at my brother’s glad to have reached the end of our journey and thrilled to begin our time with my brother Chris and his family and my brother Dominic. Do pop over to read Michelangelo’s post, Destination- Mt Isa. REally enjoyed this Erin. You certainly put in some km that day! Thank you for your enthusiasm you keep me motivated to keep writing this journal. Looking back I realise it was a big effort.